Balloons @ Just Us Girls! Hello Friends! 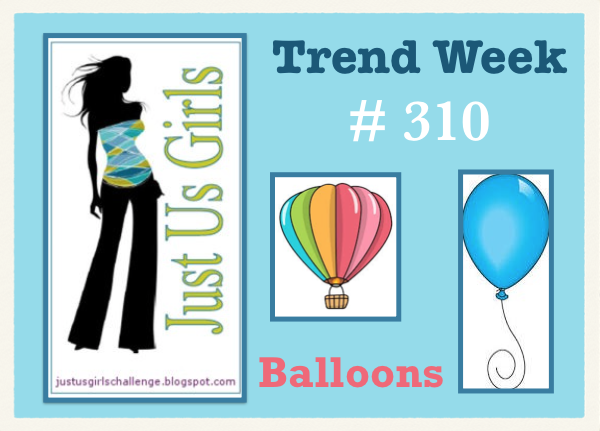 It’s Trend week over at Just Us Girls and it seems that balloons of any kind never go out of style in the card making world, so that is our trend for the week. I also am linking my card up to this week’s Freshly Made Sketch which was the source of my starting point. You should have seen all my different attempts to a card till I finally settled on this one. It reminded of those days when you are getting dressed for work in the morning and every outfit looks terrible and you just keep changing your mind till you have a pile on the bed in front of you. Well, that is what happened with this card…LOL It had many do overs! I still have a lot to learn when it comes to coloring, but I think the card came out kinda cute, plus it’s quite different than my usual style. Card Info: The balloon was made from a hand drawn template. The ladybug stamp is something I picked up who knows where and who knows how long ago, probably 10+ years. The happy birthday banner is Stampin Up. The you is a script from Verve and the TO was made with those small alphabet stamps that always come in handy! I sure appreciate all your sweet comments and visits lately…you sure know how to make a girl feel good! Categories: Cards | Tags: Card making, Cards, Happy Birthday, rubber stamps, sketch challenge, Stamping Up, Verve Stamps | Permalink. I love that cute balloon card. Like the ladybugs too. This is quite different than your usual card, but it is sooooo stinking cute. I think it was worth all of the remakes that it took to get this one. I can see many different birthday cards with the persons favorite object on the balloon. Like a dog for my DIL. You know! This is adorable. Love the lady bug balloon. Very cute with the added lady bugs! Who wouldn’t love a lady bug balloon? So cute, Nancy. SOO CUTE! Great idea!! Nicely done I love it. Such a cute idea to put ladybugs on your balloon! Super cute card! Love that ladybug balloon! Adorable card! Thanks for joining us at FMS! Love the ladybugs! They are so sweet! Such a fun card! Thanks for joining us this week at Freshly Made Sketches! This is so cute and original, Nancy. I really like it a lot. Lady bugs and red, ohhhhhh! Oh how clever! 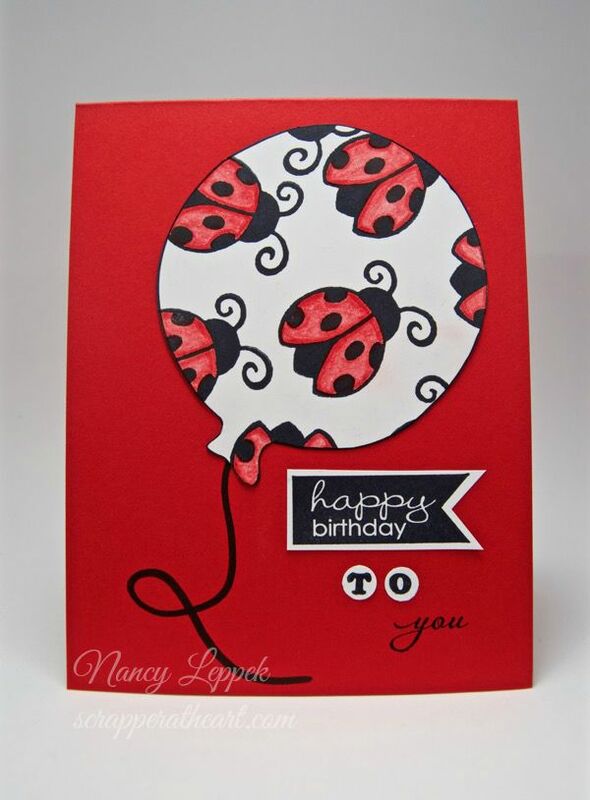 The ladybugs look awesome on your fantastic balloon, and I adore the red, black and white color combo, it’s so striking! Love that Lady Beetle balloon. Clever thinking. Your ladybug balloon is adorable! Awesome design. 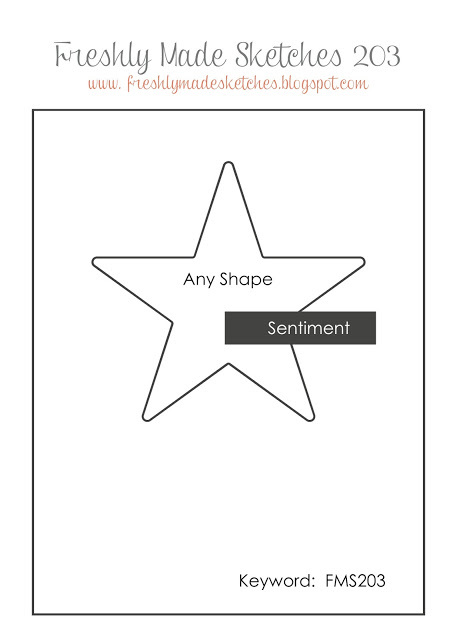 Love how you did your sentiment.